I haven’t been here in a while. I have been happily abandoning this space, somehow unable to bring out the verve with which stories are told. Last year has flown by and the new year is also moving ahead in a pace you cannot keep up with at times. After a long holiday, it has been difficult to get out of this stubborn ennui. As I opened my mails yesterday, a friend sent me a link to sign a petition. I have not done this in a while. Perhaps it reflects a staid and selfish life where the woes of the world did not affect me. Somehow this one has pricked my consciousness. So I want to write something, even if it makes no sense. For the years that I have lived in Australia now, I have been wearing my north eastern Indian identity on my sleeve, singing praises of the region I come from. In fact, I have passed on a certain Stockholm Syndrome to the man who also now believes that north east India is indeed the best part of India. But honestly, be it the food, the many cultures or the topography this is the place in the world where my realm of happiness roam wild. Above all, it is where my family still reside. And so it feels like I still have my umbilical cord uncut. My friend's petition is related to what I read yesterday. As I opened The Age, a big feature on Nagaland titled “Where men are on a rampage until women go back to the kitchen” literally brought a swath of shame. Nagaland is one of the seven states of north-east India. I cannot believe that the men in the state are up and arms against the reservation of 33 per cent seats exclusively for women candidates in a local government body. The men believe it is an inherent culture of the Nagas to demarcate roles – where men reserve the right of decision-making in worldly affairs including politics and women confine their roles within the domestic spheres. How appalling! The state has since been in turmoil with violent protests to this demand by women to take part in political affairs. I did see some Facebook posts on the issue but it didn’t hit home until yesterday. Like the rest of the world, I was busy in the cosy confines of my house and my life. But I am uneasy. For one, it is unimaginable to live in a society where such parochial mindsets prevail. 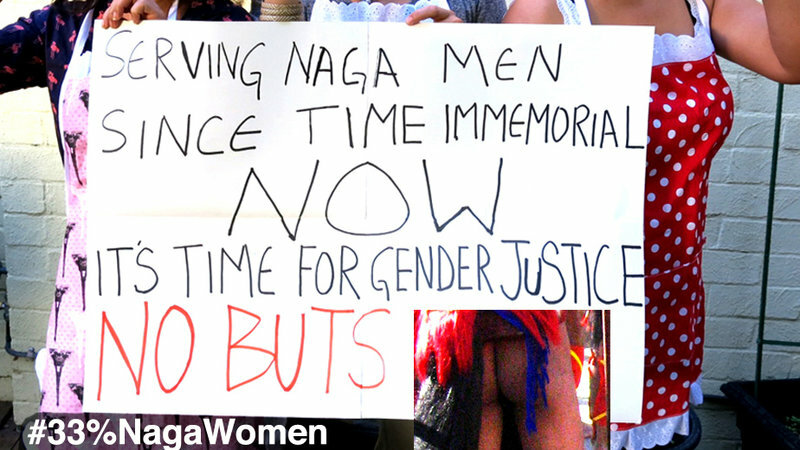 I feel for the women of Nagaland. I feel for every woman who face misogyny, male dominance and bullying. The situation in Nagaland is a form of bullying perpetrated by warped minds in the name of culture. Culture cannot be static. It cannot be guarded against time. We evolve as human beings imbibing progress – both material and mental. 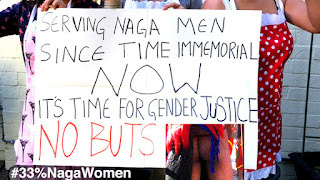 If Naga men cannot accept women marching towards some representation in politics and are so vehement about curbing women’s rights, what is the world they foresee for their children and the coming generations in years to come? This demand for women to have a political voice is a fair right. It is a human right above all. The only difference between men and women lies in our biological make up; otherwise we are all humans with the same rights and desires. Here is a petition by two friends. Do sign, if you believe in humanity.